The animation for ‘How Things Are Made’ was completed after a lengthy process, whereby learning simple animation techniques involved over-complicated and unsatisfactory PC software that wouldn’t be considered by those of a professional standard when making an animation of this length. It was, however, still an enjoyable experience, which I will be repeating; Particularly when Anti-Ghost Moon Ray start making trails for the forthcoming soundtracks for science-fiction films night on October 13th. Part of the video was initially devised as a concept for a performance piece in May 2007, involving buckets of coloured water, and was due to take place outside thirtyfive-a gallery in Brighton. At that time, I had also considered conducting an event where passengers would fill a bus to its capacity at the start of a journey and remain there for the duration. Both were a conceptual response to the work of contemporary situationist artists, particularly Francis Alys. Neither event happened in real life. Alys conducted a physical displacement event in which 500 volunteers, standing in a line on a sand dune located in Lima, Peru, were instructed to move a single shovel of sand forward, thus moving the whole dune forward from its original position. It contains the power of mythology and storytelling in its simplicity, singular conception and execution. 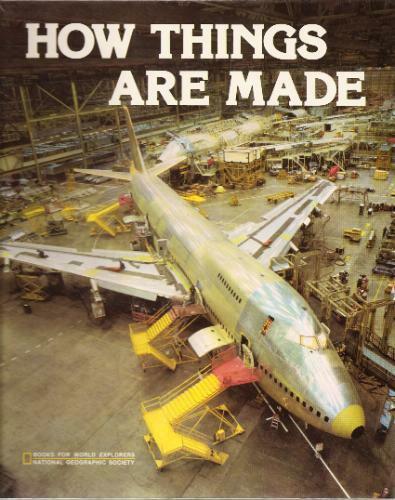 ‘How things are made’ was the title of a solo graduate exhibition in December 2004. My graduation came later than my fellow students due to an inconveniently timed bout of glandular fever which left me bed-ridden for 1 and a half months during the preparation for our final show together. The work I produced for this show was a combination of video, sculpture and installation, in which I attempted to have a maddening amount of objects and information all vying for the attention of the viewer all the time. The title of the show itself was a reference to the 1970s National Geographic book of the same name, which fuelled my particular obsession with making, and processes of all kinds. The song itself was not written when I devised the animation, and the animation was not fully realised by the time I had completed the song. Neither were initially made with the other in mind. The title was solely for the album I am currently making, but eventually I found all these elements held together well as a centrepiece for the whole work. I often find that these things come together eventually from disparate places, even when they are not intended to co-exist when they are first made.